A few weeks ago I published Hobo95's fan-made Captain America poster for all to drool over - myself included. What I didn't chuck up, was his efforts on the other big-screen-bound Avenger; Thor. Impressed much? See Hobo95's other Thor movie work after the jump. As someone who likes to make a lot of fan made stuff myself with the aid of adobe photoshop and illustrator i must say this poster rocks! And that is a cool tag line, almost as much as my tag line for Deadshot :) Speaking of "tagging", this week's crazy cool cover is something else Dan! Let me tell ya something as a guy who's lived on an Israeli army base for a while nothing is sexier then hot women with automatic rifles fitted with grenade launchers. Sigh...I love Thor. 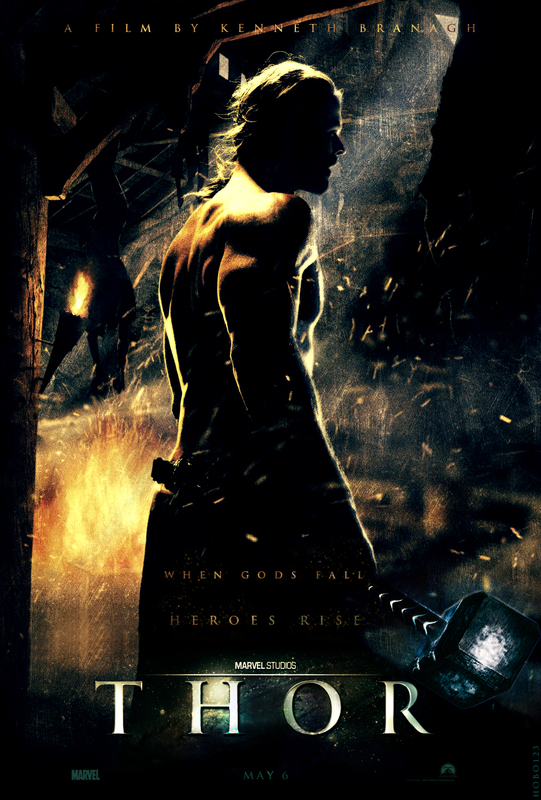 I love this poster of Thor. Beautiful work Hobo95! I want this movie out now. Yesterday. There aren't enough movies about Norse gods. And rewinding that one scene with Vincent D'Onofrio in Adventures in Babysitting doesn't really count. This guy is amazing. Why some studio exec hasn't snagged this guy yet is beyond me. David, I'm there with you on that Mystique cover. Not the most practical uniform, but for some reason I like it anyway. I have a feeling they're not going to go with my tagline idea - "Get Hammered!" Joking aside, cool dramatic stuff, Dan! At work my screen is massive, and looks more like a digital tv - especially with the colours and clarity - and this stunner has been plastered across it for the last few weeks. Really great stuff! @RN I agree they need more God movies. Mind you if Hollywood loves Thor we'll probably be drowning in imitators soon enough! @Aaron lol yeah they might pass on that one - unless they do the origin years of Thor in his Nirvana lovin' days! @David and Craig I'm glad you guys love that Wolvie cover, I think it's one of Ron's best - and the guys done more than a few! Pulling Mystique from general baddie to heavy hitter is one of the best effects comic movies have had back on the medium I reckon. She is such a twisted character it's brilliant. This is fan-made? Holy cow!! Liss, you should see the Captain America poster this guy did. Simply amazing. Way better than the stuff the studios tend to come up with. Of course they've got egos to attend to. He's all about the presentation.